But the Bank of Canada’s interest-rate cut was appropriate, the PM said. Prime Minister Stephen Harper suggested the impact of the oil price shock on the economy as a whole will be limited. OTTAWA—A day after the Bank of Canada lowered interest rates to cushion the oil price shock, Prime Minister Stephen Harper played down the damage faced by the Canadian economy. “These things are creating some shocks that will impact us but they’re not going to throw us off our fundamental growth path or undermine the very strong fundamentals of the Canadian economy,” Harper told reporters during a visit to St. Catharines. He said the impact of the oil price decline will be significant but added that the Bank of Canada’s action does not indicate that the Canadian economy is in worse shape than Ottawa has acknowledged. Nor does it indicate that the federal government should be looking at bringing in stimulative spending measures to prop up the economy, Harper said Thursday. “They (the bank) said the economy will grow somewhat slower than previously anticipated but they do anticipate growth for the coming year,” Harper told reporters. While expressing concern about the economic problems caused by plummeting petroleum prices, the Bank of Canada said Wednesday the economy would pick up later in 2015 after slowing sharply to a rate of growth of 1.5 per cent in the first half of the year. For the year as a whole, the Bank of Canada said growth would be 2.1 per cent, down from the 2.4 per cent growth bank governor Stephen Poloz predicted only a few months previously. “The government has complete confidence in the Bank of Canada in the actions that it has taken,” Harper said. He added that for the government’s part, the appropriate action as long as the economy continues to grow is to eliminate the federal deficit and balance Ottawa’s books. Economists have questioned whether the Conservatives will be able to fulfill their promise to eliminate the budget deficit this year because of the hit on federal tax revenues caused by falling oil prices. And the federal government said last week that the budget will be put off from the usual February-March time slot until at least April so Ottawa can deal with the market instability sparked by the oil price drop. But Harper reiterated that his government plans to balance the books in 2015. He acknowledged that, to head off a slide back into a deficit this year, Finance Minister Joe Oliver might have to tap the $3 billion contingency fund that is provided annually as a safety valve in the budget. 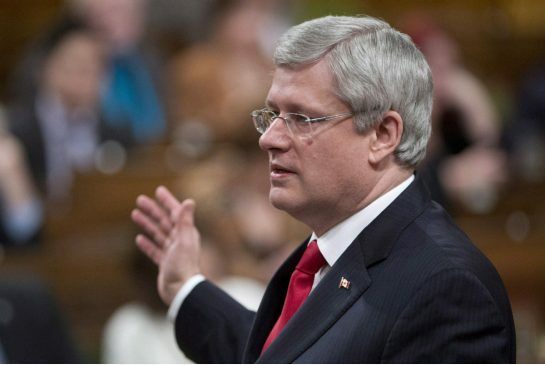 “The contingency fund is obviously available for unforeseen circumstances,” Harper said. He said the oil price decline would have a significant impact on the oil industry — “there’ll be some pain” — but said the industry is resilient and will come back. “The oil industry isn’t remotely the entire Canadian economy,” Harper remarked, suggesting that the impact of the crunch in the petroleum sector will be limited. Harper was in St. Catharines to announce an increase in federal financial assistance for small businesses. the the Criminal Cartel called "The Children's Aid Societies of Ontario". on professional fabricators of evidence.